Ever since the National Democratic Alliance came to power, reports of NGOs being harassed emerge at regular intervals. The latest incidents involve barring former additional solicitor general Indira Jaising's The Lawyers' Collective and Teesta Setalvad's Sabrang Trust from receiving foreign funds by the ministry of home affairs. A few days ago, representatives of over 700 NGOs from all across the country met and demanded that the government stop harassing NGOs using the Foreign Contribution Regulation Act and other regulatory mechanisms as tools. 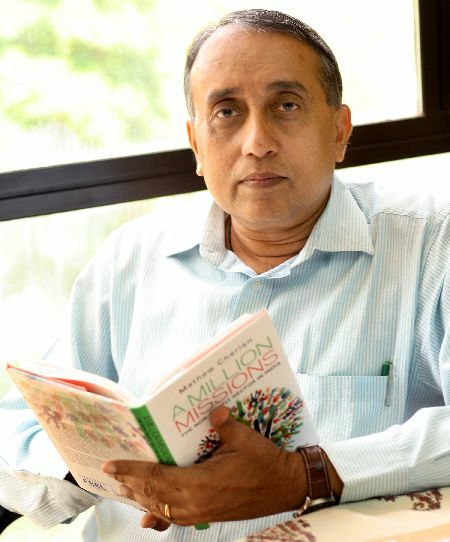 Mathew Cherian, below, left, chairperson, Voluntary Association Network of India, the largest federation of NGOs in the country, tells Shobha Warrier/Rediff.com about the complaints NGOs have about the government. Recently, representatives from 700 NGOs met and complained about the harassment meted out by the government. In what way is the government harassing you? Is it only by using the FCRA? VANI, as you know is the network of 700 NGOs across the country, and we felt that of late, there has been more pressure on the NGOs from the central government. What they did first was cancel the licenses of 10,700 NGOs en masse on some flimsy reasons like somebody submitted a report a day late. All this was done without any show cause notice. Even a common criminal is served a show cause notice. That is the law of the land. This was done arbitrarily. Then they started action against Greenpeace and many other NGOs. The very recent was the cancellation of the FCRA for the Lawyers Collective and the Sabrang Trust. In the Lawyers Collective case the reason given was quite flimsy; that Anand Grover from the NGO spent $50 on an ISD call when he was in the US. Grover, Indira Jaising's husband, also is a lawyer working on the LGBT law. As it was coming up for hearing, he called his people from the US and discussed this issue before coming back from the US to argue the case. Ultimately what happened was the government cancelled the NGO's FCRA. Did you see it as the last straw before deciding to protest? Yes, this was the last straw because they cancelled the FCRA on such a flimsy ground. We are not saying you should not cancel the FCRA. Yes, if somebody has violated the law, you should cancel. The government continues to de-register NGOs in the FCRA list. They are using the Intelligence Bureau to go after the NGOs. Why do you think the NDA government is after NGOs? It is not only the NDA, the United Progressive Alliance also didn't like NGOs. The UPA was no better in dealing with NGOs. No government likes NGOs because we have more support at the local level. Civil society supports us more than they support the governments. Wherever you go, you will see that NGOs are more popular than political parties. That is why none of the state leaders also like NGOs. You mean, politicians feel threatened by NGOs? Yes, they feel threatened because we have more popularity at the grassroots level. Do you think the politicians fear NGOs using this power to attain something else? That's the key question. NGOs used to get Rs 13,500 crore (Rs 135 billion) as FCRA which has come down to Rs 7,600 crore (Rs 76 billion). Tell me can this amount destabilise a government? It is not possible. Is this country so weak that Rs 7,600 crore can destabilise it? That is overestimating NGOs by 100 to 200 per cent. These same governments go abroad and ask foreign companies to come and Make in India and ask for FDI. We are actually using this money on social causes, on poor people, the Dalits, the tribals and marginalised communities. It is an old argument. When the Government of India wanted a seat in the United Nations Security Council, some developed countries raised the objection by asking, can you have a country that receives aid as an equal Security Council member? They said, you can have a country when it's a trade partner and not an aid partner. What they asked was, how can you beg for money on one hand and then pose as a super power? These objections were raised by the G- 7 countries. The Government of India is aware of this. So, India has been consciously cutting down on aid from foreign countries. Is it only to be a permanent member of the Security Council that the government is cancelling FCRA and cancelling NGOs? I cannot answer the question as I do not know what they think. It is basically based on the presumption that if we have to be a super power, we have to stop aid coming to the country. Is it not possible for NGOs to raise this much money within the country? It is possible. There are 300 million middle class (Indians) and it is possible to raise the money here itself. We are not saying it is not possible. But it is a fundamental right of an NGO to take the money when somebody living abroad gives you money. If a company has a right to receive FDI, an NGO also has a right to receive money from foreign sources. We want a level playing field. We are also involved in training and skilling people. We have worked in eradicating leprosy. We are involved in many programmes like building toilets. Is it because the government is not allowing NGOs to raise funds abroad that foreign funds have come down to half? When you cancel out 10,700 NGOs, naturally money coming also will drop. They have blocked 17 European NGOs from giving money to India. They have blocked the Ford Foundation from giving money to India. They have been acting strange with foreign funders also. Has it started only after the NDA came to power? When the UPA was in power, they had blocked some NGOs because of the Koodankulam nuclear power plant agitation. That was done when P Chidambaram was the home minister. If you ask me only if this government was harassing us, no, the UPA also was equally bad. They were also up to their own tricks. In fact, both the BJP (Bharatiya Janata Party) and the Congress received money from foreign companies during the elections. And both the parties are covered under the same FCRA law. When they got notices, both the parties tried to change the law with an amendment. 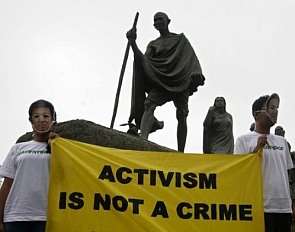 Do you feel various governments use FCRA as a weapon to hunt down NGOs? Yes, they are using it as a weapon. Many NGOs say the FCRA is unconstitutional. In what way is it unconstitutional? You have to look at Sections 12 and 13 of the law. Freedom of Association is a fundamental right. NGOs are fighting for legal remedies like we were associated with the RTI, right to education law, HIV/AIDS bill and the LGBT bill. When you prevent NGOs from doing so, you are preventing the marginalised from getting into association and fighting for their rights and justice. NGOs predominantly work with the poor. We don't work with the rich. So, when you cancel an NGO, the affected are the poor, the Dalits, the tribals, the street children and the marginalised. Let us hand over all this to the government and let them run it. You said the home ministry should not be the nodal authority for NGOs. Who should control the NGOs? What we are saying is the ministry of finance is the right ministry and not the home ministry. Can you imagine policemen trying to find out about finances? Do you think the survival of the NGOs is under threat? No, NGOs will survive. There are many Indians who would donate. That is not the issue. Freedom of association should be there, and we shouldn't be unnecessarily harassed. It is our fundamental right.